Families are a little like potatoes: they come in all shapes and sizes, some are old, some are new and some of them love to get covered in mud. The world of travel often seems to forget this and it can be enormously frustrating to be faced with the words “No properties found” when searching for a hotel. 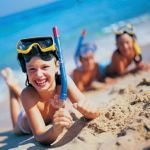 Happily, there are a number of holiday companies and hotels ways that embrace the spud-like nature of families, as we explain below. When you decide to have more than two children or you find yourself blessed with more babies than you expected, life changes. The world is designed for families with two children so things start getting tougher – you probably need to get a bigger car, the parents get outnumbered when deciding what to do as a family and it suddenly becomes much more difficult to find hotels. According to the Office for National Statistics figures for 2015, 11.1% of British families had three dependent children, 2.6% had four children and 0.9% had five or more. So finding suitable holidays can be a problem for one in seven families. What’s the answer? A number of hotels offer dedicated family rooms or suites that cater for big families. Sands Resort near Newquay is the perfect hotel for larger families and offers a number of accommodation options, including interconnecting rooms and apartment suites, for families of up to seven people. The hotel also has extensive leisure facilities, including swimming pools, a tennis court, crazy golf and a maze. The bodyboarding beaches of north Cornwall are a just a short distance away. Jersey’s family-friendly Merton Hotel has a different way of dealing with larger families. Right next door to the hotel it has a block of self-catering suites for the larger family but with the benefit of full service from the hotel. The Merton’s Trinity Suite is actually three interconnecting suites that can sleep up to 12. Self-catering is a popular option among larger families and the New Forest has plenty to do and see, including walks, cycling and the beaches of the South Coast not far away either. i-escape.com has handpicked a stylish collection of family apartments which offer good value, and all the space, privacy and freedom that you won’t get at most hotels. For example, how about renting a canal boat in Amsterdam or an architect-designed apartment in Barcelona. Puglia’s Borgo Egnazia, overlooking the Adriatic, consists of a traditional five-star hotel, a village of townhouses as well as 28 three-bedroom villas with their own private pools for larger families. For the very largest groups, these villas can be interconnected. The 49-acre grounds sit between ancient olive groves in the Valle d’Itria hills. Another option for a larger family is to rent a large holiday home overseas. Oliver’s Travel has chateaux in France and houses in Tuscany for example while Sitges Hills Villas has an impressive collection of properties overlooking the Med near Barcelona. If you want a trip overseas but money is tight then look to France. Siblu has 17 luxury campsites with pools and entertainment facilities across the country and its mobile homes sleep up to eight people. How about a family boating holiday in France? Rent one of these motor cruisers (they sleep up to 12 people; no experience required) and you can putter along canals and rivers exploring the beauty of rural France with time for cycling, swimming, walking, fishing and plenty of wine drinking. Locations include Brittany, Burgundy, the Loire Valley and the Canal du Midi. 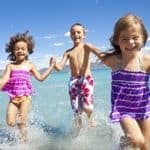 Jet2Holidays has a collection of hotels with water parks, many with family rooms, and all with flights from across the UK. It also has school holiday offers. Bulgaria is a great option for bargain summer sun. The resort of Sunny Beach has Blue Flag beaches and family-friendly hotels such as the all-inclusive Hotel Sol Nessebar Palace which has water slides and spacious family rooms with a separate kids’ bedroom. 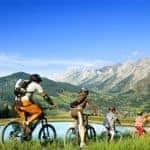 Peak Retreats, meanwhile, offers summer and winter breaks in smaller resorts in the French Alps in apartments. Its focus on the lesser-known resorts means you get more bang for your buck (or should that be euro?). A lot of families follow the traditional model of having two children (40% of British families) but do not follow the traditional two-year gap between the two kids, either out of choice or because nature sometimes gets in the way. Increasingly too, there are families made up of one or more divorced parents who may bring children of different ages to the new family. This can be a challenge when organising a holiday as you have to think about how to keep the different age groups occupied. Activity holidays can be a good answer to this problem. Mark Warner is a leader in activity breaks. 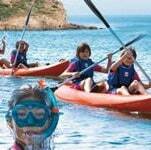 At its resorts around the Med, there is childcare for different age groups ranging from two to 17 years as well as activities for everyone – splash pools, kayaking, SUP boarding, sailing and tennis. Round Hill in Jamaica is sure to please mixed age groups. It has a cluster of villas with private pools within a luxury resort, available as B&B, half board or on an all-inclusive basis. 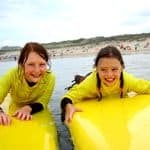 Keeping everyone entertained is simple – there are watersports including snorkelling, scuba diving and water skiing as well as a great Kids Club. Sani Club in Halkidiki has spacious bungalows around the resort which are great for family groups. For the age mix, there are football and sailing academies, art classes and even a beach babysitting service that is free for the first 30 minutes. There is plenty of entertainment in the evenings too, a must-have for mixed groups like this. Other overseas options we like for larger families because of their villa accommodation are Beaches all-inclusive resorts and the Six Senses Zighy Bay in the wonderfully family-friendly country of Oman. 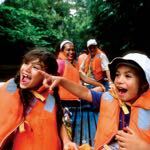 When you travel with members of the wider family, grandparents, uncles and aunts, things can get complicated because of the very different activities that appeal to different generations. Staying in a cottage is a great holiday for a multi-generational group. Everyone from the kids to great aunt Nora can chip in with the catering and a county like Devon means there is a huge amount of things to do on the doorstep, from trips to the British Riviera resorts and the sandy expanses of Woolacombe to walks on Exmoor and sites for animal-lovers including Paignton Zoo and Sidmouth Donkey Sanctuary. Helpful Holidays has the best selection of cottages in Devon. Over the border in Cornwall, Classic Cottages has a huge range of properties; holiday ideas including surfing on the northern beaches, a trip to the Eden Project or the Lost Gardens of Heligan and walks along the craggy coastal paths and out to Land’s End for the photo opportunity. The Lake District has a similarly broad range of activities – messing about on boats, family hikes in some of the country’s best scenery and interesting days out to places such as the Derwent Pencil Museum, the Puzzling Place and the World of Beatrix Potter. Sykes Cottages has a wide selection of places to stay locally. A British stay with a family-friendly twist is available at some of the country’s working farms from Scotland to the South West. Think animal petting, helping with the milking, great local food and stunning walks in the countryside and you get the idea. You’ll also find some wonderful cottages to rent in Norfolk and Northumberland whether you want to be close to a beach or tucked away in bucolic countryside. A step up from the holiday cottage is the big party house, such as offered by the specialists at The Big Domain. Places like this are ideal for spending a big family birthday – granny’s 70th with the extended family, for example. Villas are the perfect option for multi-generational families. At the top end, you can stay with companies like Scott Dunn, who offer fully staffed villas with childcare and cooks to take away the headaches of looking after large groups. If you don’t need childcare, then Virgin Limited Edition’s beautiful catered villas in an unspoiled part of Majorca are ideal. If you prefer self-catering, GIC The Villa Collection has a portfolio of beautiful villas across the Greek islands including Kefalonia. Oliver’s Travels has some lovely houses in Croatia including many with a private pool – you can find them on the coast or within walking distance of local villages. Another idea in Croatia: explore some of the country’s sublime coastline and 1,000 islands by chartering a gulet or yacht from Sail Dalmatia. See its latest special offers. Simpson Travel has a great collection of villas with pools along the Aegean Coast of Turkey. If Spain is more to your taste, try these from Vintage Travel in Catalunya or Mallorca or Galicia in the North.